Summary: A new study reveals how neurons in the prefrontal cortex and hippocampal neurons work together to help guide future learning. The study, led by Matthew Shapiro, PhD, Professor of Neuroscience at the Icahn School of Medicine at Mount Sinai, investigated memory flexibility and interference, the mechanisms by which the brain interprets events and anticipates their likely outcomes. 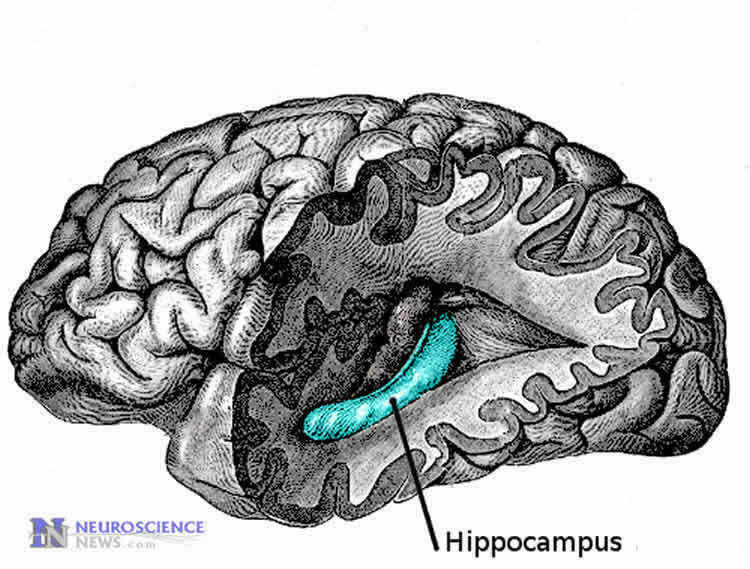 The hippocampus is a temporal lobe brain structure needed for remembering recent events: for example, where you ate your last meal. The prefrontal cortex is where the brain uses context to switch flexibility between remembered rules, such as knowing to look left before crossing a street in North America but right before crossing in Britain. Without such rules, memories interfere with one another and predictions based on memory are inaccurate. High-functioning individuals rapidly integrate memories with goals to choose their course of action. This cognitive flexibility requires interaction between the prefrontal cortex and hippocampus. Previous research indicates that interactions between these two brain regions are disrupted in many neuropsychiatric conditions, including schizophrenia, depression, and attention deficit disorder, but the mechanisms of these interactions have largely remained a mystery. The research team tested spatial memory in rats using a plus-shaped maze in a task that depends on hippocampal function. The rats were trained to walk from the far end of a start arm (North or South) through a choice point to the end of one of two goal arms (West or East) to find hidden food. After the rat returned reliably to the rewarded spatial goal from each of the two start arms (e.g. “go East”), the opposite goal was rewarded and the animals had to learn a rule reversal (e.g. “go West”). The research team found that intact rats learned an initial goal and performed roughly three reversals each day, while rats with prefrontal cortex dysfunction learned only the initial goal; rats with hippocampal dysfunction learned none. This observation suggested that the prefrontal cortex might teach the hippocampus to differentiate goal-related memories. To test this hypothesis, researchers placed micro-electrodes into both the prefrontal cortex and hippocampus and recorded the activity of ensembles of single neurons in both structures during learning and stable memory performance in the plus-shaped maze. NeuroscienceNews.com image is for illustrative purposes only. They also found that the prefrontal cortex most strongly altered hippocampal place cell activity during reversals, just before a rat learned to reliably select a new goal. Moreover, the strength of the prefrontal modulation of hippocampal activity predicted how quickly the rats learned the next reversal. In other words, the more that the hippocampus “learned” what the prefrontal cortex “taught,” the faster the rat learned the next rule. Mount Sinai Hopsital “How Learning in the Present Shapes Future Learning.” NeuroscienceNews. NeuroscienceNews, 6 April 2017. Mount Sinai Hopsital “How Learning in the Present Shapes Future Learning.” http://neurosciencenews.com/present-future-learning-6358/ (accessed April 6, 2017). The prefrontal cortex (PFC) is crucial for accurate memory performance when prior knowledge interferes with new learning, but the mechanisms that minimize proactive interference are unknown. To investigate these, we assessed the influence of medial PFC (mPFC) activity on spatial learning and hippocampal coding in a plus maze task that requires both structures. mPFC inactivation did not impair spatial learning or retrieval per se, but impaired the ability to follow changing spatial rules. mPFC and CA1 ensembles recorded simultaneously predicted goal choices and tracked changing rules; inactivating mPFC attenuated CA1 prospective coding. mPFC activity modified CA1 codes during learning, which in turn predicted how quickly rats adapted to subsequent rule changes. The results suggest that task rules signaled by the mPFC become incorporated into hippocampal representations and support prospective coding. By this mechanism, mPFC activity prevents interference by “teaching” the hippocampus to retrieve distinct representations of similar circumstances. The Future will always be the Present for us.